Ex Nihilo comes from the Latin meaning “out of nothing.” It is often seen in theology when talking about different concepts of creation. It is a fitting name for the main antagonist in Jonathan Hickman’s first arc of Avengers. Ex Nihilo and his sister, Abyss, and their robot nanny, Aleph, have traveled the universe for hundreds of thousands of years; worlds recreated and destroyed to meet their image of perfection. On the surface it appears that the events with Ex Nihilo and Abyss in the first two issues of Avengers reach their conclusion in issue #3. I don’t want to spoil anything for those that have not finished the book yet (I’ll continue with spoilers below), but this issue does not disappoint. We have an antagonist that poses a huge threat to all of life on Earth. His intentions are not malicious. If he does not improve Earth to “perfection” then Aleph will destroy it. It’s all very complicated ideological hypocrisy that only the oldest of beings in the universe would fuss over. Captain America arrives with his band of backup Avengers to show these powerful shapers of worlds the best that Earth has to offer. 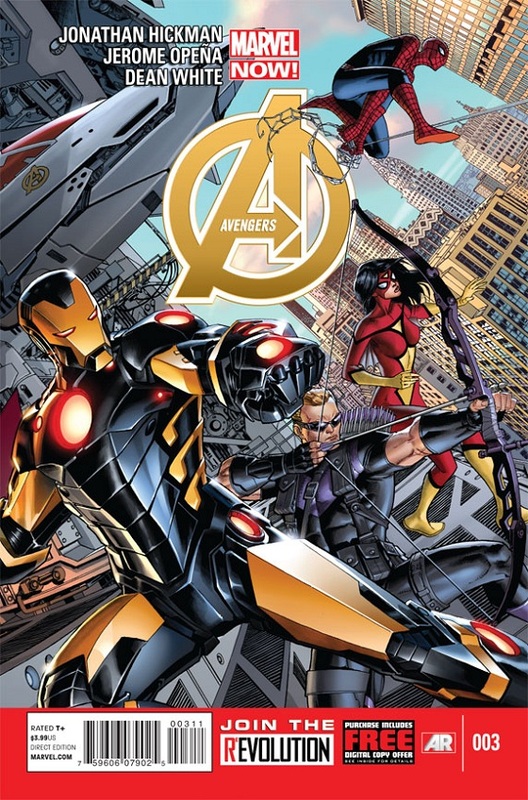 I was pleased that Hickman let many of these replacements show why they are not just replacements, but Avengers. One in particular has a very huge impact on the entire conflict resolution and I am looking forward to see more of this character. The last spoiler-free thing I want to mention is about the dialog. Despite the serious moral and theological themes present in this arc, Hickman still slips in small moments of humor with quips from the heroes. Jerome Opeña’s art is beautiful and full of lush awesome detail. Back in issue #1 Captain America gets scratched in the face. He’s been sporting a nice butterfly suture consistently ever since. Opeña’s eye for detail is incredible. For those of you waiting to marathon or read this in trade then you will not be disappointed with the continuity in the art. White, Martin, and Isanove’s colors are also brilliant and bring this book to life. There is a real “painted” look they have added to the already stellar art of Opeña. Beginning some spoilery stuff! Skip to The Verdict!. Turn back now! There be spoilers! As someone that has a background in literature, I sometimes feel compelled to look up anything looking remotely Latin. I’m glad I did, as it added a little more to this story. I mentioned that ex nihilo means “out of nothing.” In the phrase creatio ex nihilo it translates to “creation out of nothing.” A similar phrase creation ex materia means “creation out of something pre-existent.” Hickman really did his homework and threw us some small clues early on in the story. Why would a being named for creating out of nothing be one that creates from what is already there? With the philosophical and ideological changes Captain Universe brings to Ex Nihilo and Abyss, the name fits more than it did before. They are now left on Mars to create something new. There is more I’d love to go into with this, including the creation of the two antagonists and how their names represent a lot more, but I’m going to close it up for now. I merely want to point out that there is a lot of thought in Hickman’s writing, and I feel we will be seeing these two again. In what role and to what extent has yet to be seen. I am eagerly awaiting the start of the next arc. End of spoilers! You can open your eyes! The boogeyman has gone away! If you are a fan of Hickman’s other works then buy this. If you like philosophical stories that make you think then buy this. This is not a simple story of good versus evil. If you prefer simpler stories, you may still enjoy this on the surface. It has fighting and smashing, but some of the dialog may feel tedious. If art is your thing, then buy it. The art feels alive and is a beautiful compliment to the themes of life and creation. Jumping on point: This may not be the best choice to jump on. Go back and pick up the first two issues or jump on with the next issue. Nice review. Enjoyed your insights on the “Mother is not mad, just disappointed, so stop it!” encounter, and I am very much looking forward to reading more about this character. Hickman has proven that he can juggle a daunting amount of characters and give them all a voice and a perspective, so I’m hoping that this expanded roster continues to play a part as the book moves forward. 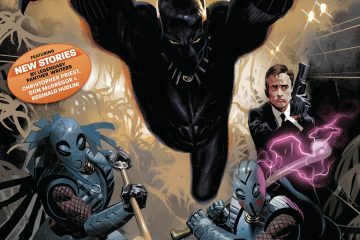 And issue 4 looks to be indicating I might get my wish. Thanks for replying. Sorry it took me a few days to reply. Just got busy! You’re right. They are a bit dense, but with Hickman controlling it they are still fun.